Researchers have drawn the conclusion that sea lions suffer brain damage due to a deadly algae toxin after an exponential increase in the number of marine mammals stranded on the coast. There has been a slight increase in the population of California sea lions that end up in bad shape on the beach. Increased water temperatures have been deemed as just one of the culprits. Scientists at the Marine Mammal Center in Sausalito analyzed MRI scans of the brains of 30 California sea lions. They found that the animals had suffered significant damage in the hippocampus, the region of the brain associated with memory and spatial navigation. Furthermore, their tests also showed that there was a weaker connection between the hippocampus and the thalamus, a structure within the brain linked to motor functions and sensory perception. The lesions found could be an explanationation of their neurological dysfunction and behavioral changes that affects their successful navigation across the waters. It impairs their ability of surviving in the wild because it disrupts their ability to swim or hunt. Researchers further investigated the cause of the brain lesions, and attributed them to an algae toxin. All California sea lions who displayed neurological problems, disorientation or seizures showed a high toxicity with domoic acid. It’s a toxin found in a microscopic algae, Pseudo-nitzschia, that grows naturally around the shores of California. The algae naturally blooms in the spring and fall, when small fishes or other marine creatures feed on it. 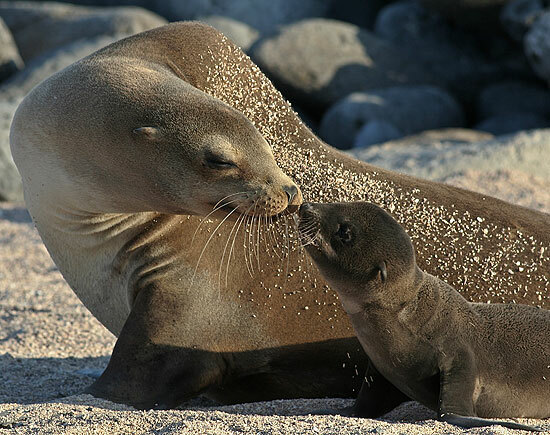 The sea lions or seabirds, in turn, then gain exposure to the toxin by preying on those animals and consuming them. According to Peter Cook from Emory University, this leads to brain damage, chronic epilepsy and behavioral changes, which lead to strandings and high mortality. However, this has not seemed to be such a damaging problem until now. This year’s algae bloom appears to have spread from California, and as far away as Alaska. It’s believed that due to ocean pollution, by spilled fertilizers, and warming water temperatures, due to global warming, has extended the presence of Pseudo-nitzschia. The two factors could have exponentially increased the size and frequency of the algae. According to Cook, the marine plant has been present in the environment for a very long time. However, they are noticing an increase, and it has started to cause brain damage in sea lions since the 1980s. It affects their ability to survive out in the wild, which leaves them stranded or, worse, dead on the Californian shores.